A Carbonizzare in Grand Theft Auto V.
"I love my Grotti. She is finer than any woman will ever be." - Richman resident Nicholas, official website description. 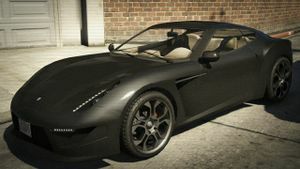 The Grotti Carbonizzare is a sports car in Grand Theft Auto V.
The Carbonizzare mostly shares styling cues with the Aston Martin V12 Zagato. This is evident from the rear, and also side profile of the car, including the alloy wheels. Unlike the V12 Zagato, the Carbonizzare features twin taillights, similar to pre-2009 Ferrari models. The car's front fascia and headlights are also largely inspired by post-2009 Ferrari models, which could make the Carbonizzare similar to the Ferrari F12berlinetta and Ferrari California (more likely the latter as due to the fact that the Carbonizzare has a V8 engine). The Carbonizzare also borrows some cues from the Nissan GT-R.
GTA V, drop-top variant (Rear quarter view). The Carbonizzare is powered by a 5.0L 570 bhp V8 engine. The Carbonizzare has a decent acceleration, reaching 60 mph (97 km/h) within 3.5 seconds and then going on up to a top speed of 198 mph (319 km/h). The front engine, rear-wheel-drive layout tends to be a problem for the car's handling, but it shouldn't pose too much of a problem if the driver exercises caution and care when driving on difficult roads. As the Carbonizzare is based on the Aston Martin V12 Zagato, the police radio would refer to it as a Dewbauchee vehicle until patch v1.01. "Carbonizzare" means carbonize in Italian. Purchasable through Legendarymotorsport.net for $195,000 (GTA Online only). This page was last modified on 11 April 2015, at 19:27.